I hit the new and used store the other day, and came across some old wooden shoes. I posted them on Instagram and Facebook, (read the replies in those links) asking what in the world others would do with them. Well, you convinced me I HAD to bring them home, even without a goal in mind. Leaving the wooden shoes in their original patina (for now), a hole was predrilled in each, then attached to the entry wall with screws. There’s just something about an organic wood patina that I can’t bear to treat nor cover. Sorry painters, but I think I’m a little addicted to them as is! Well, that just started all kinds of other goodness going on. 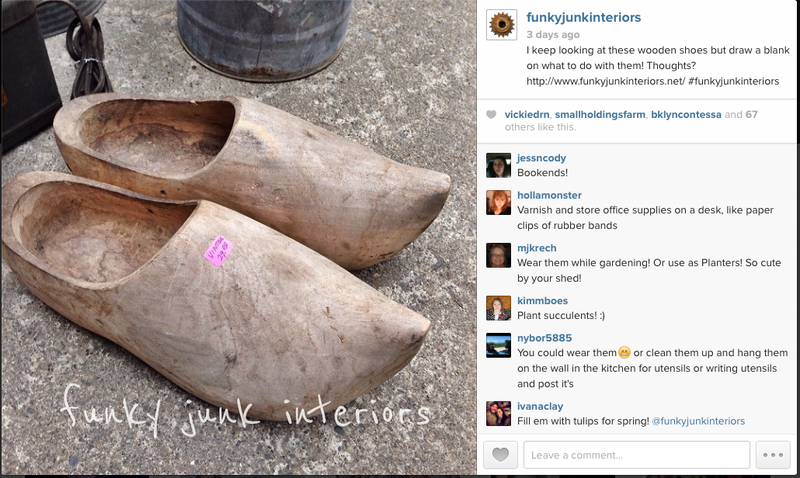 You can’t just hang fabulous wooden shoes filled with moss and plants and not do up the entire space! Nope. Spring decorating with mossy wooden shoes definitely happened. And here we have what I think is my personal favourite piece. 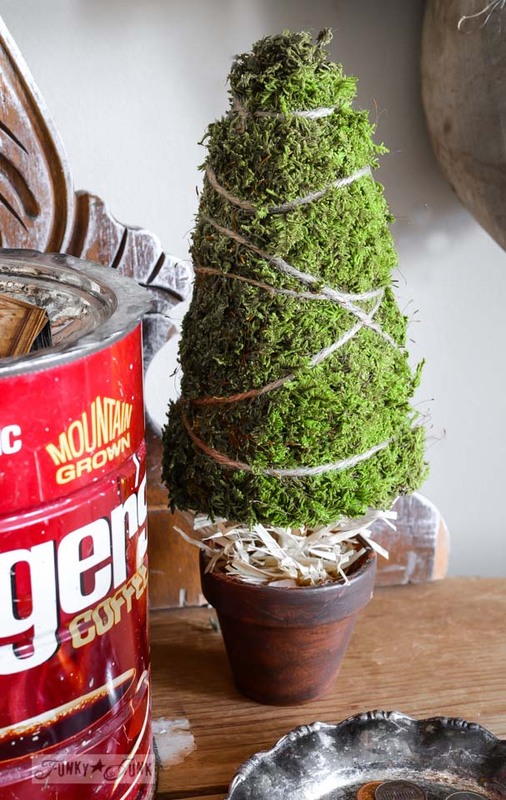 This mini cone shaped topiary was created with a solid sheet of moss, hot glued onto a cone form, then wrapped with jute twine. A little raffia inside a stained clay pot and it turned out as cute as can be! My crafting friends while at the Michaels Hometalk Pinterest Party will recognize it! It was SO fun crafting along side everyone! The moss topiaries made prior are hiding in the background as well. 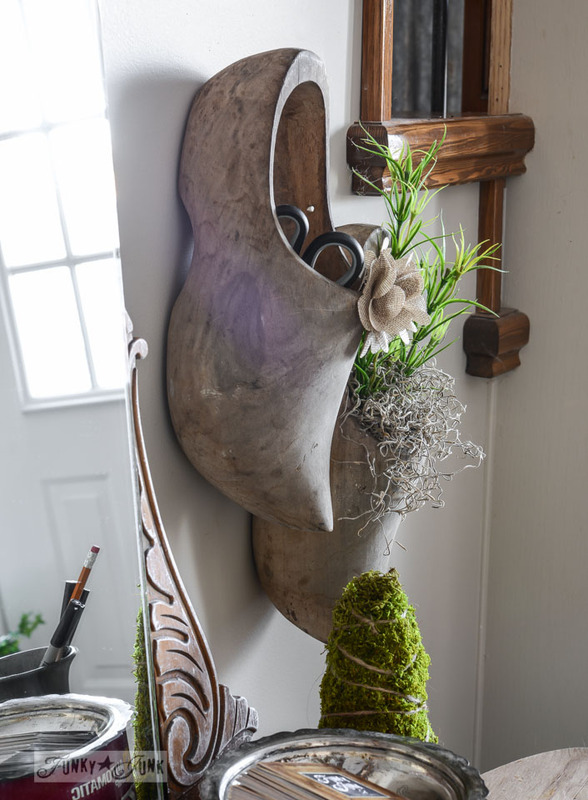 Just a few little elements thrown together became an entryway all ready for spring! Even with snow still on the ground. All because of a couple of old wooden shoes. What would you have done with them? Oh! Those clogs are fantastic. We’re Dutch, so this sings to my heart! Great find, Donna! Love love love them! 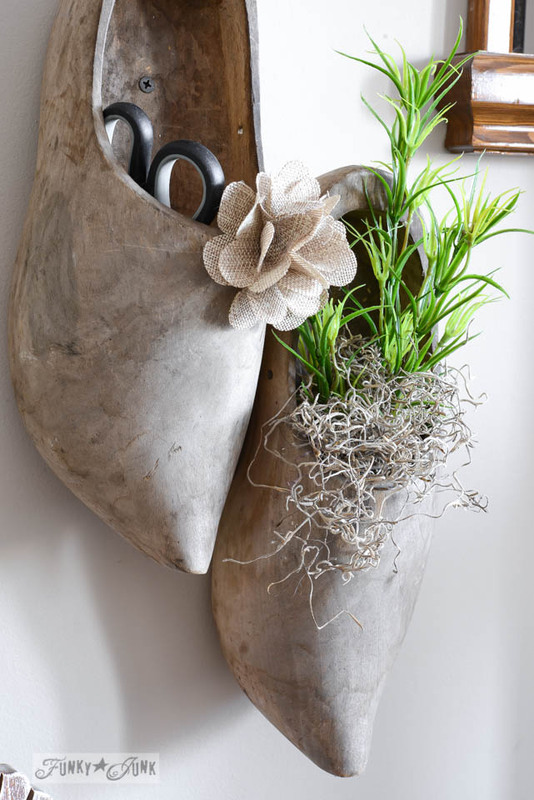 Love the idea of hanging the clogs on the wall! Also took a look at your moss topiaries and was just reminded of the fact that I have moss growing in the back part of my yard…yippee! What a great find! I love the way you styled them and I know you’ll have fun changing what they hold as the seasons change. I have three meat grinders in my basement and had no idea what to do with them. I’m going to use one of them like you have as a pencil holder on my desk. What a great idea! 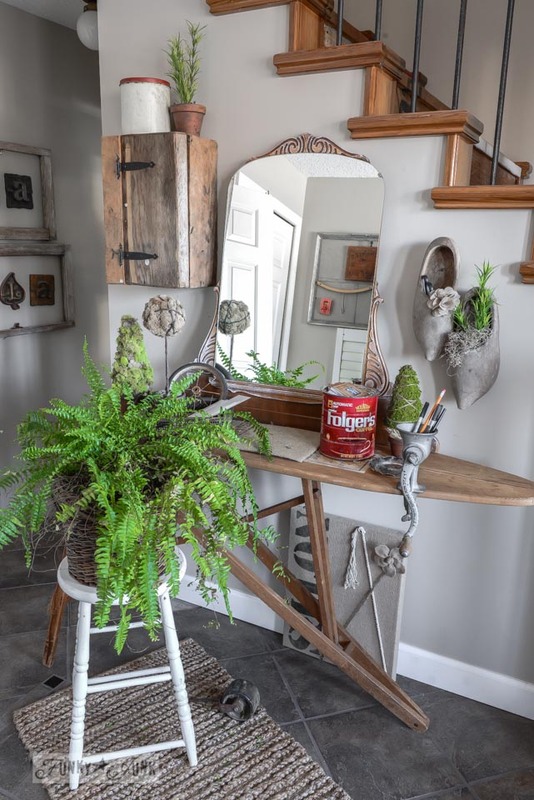 I love how your entryway turned out. Don’t you just love how you can pull together a bunch of items you already have and create a whole new space? It’s such fun! Now I want stay home and play rather than go to work. 🙂 The shoes are great! I wouldn’t paint them – it would just cover up their history. Darn-it, these are so adorable, makes me wish I kept the ones from my childhood. Oh those little wooden shoes are fantastic..perfect way to use them! Love the pops of green! Oh my goodness, Donna – Love those wooden shoes!!! Pinned! I have a pair of wooden shoes with a chippy yellow paint finish that I have used in the garden. I love yours on the wall. They are perfect with your vignette. I love the rustic cabinet on the wall and the frames. That’s my kind of style! Good idea for the wooden shoes, too! LOVE these Donna! I love the rustic wood tone of them mixed with the fresh bright green – so earthy and springy. Brilliant use. Great idea to bring the nature inside. I also like the mirror from the picture you posted. Did you add the ornaments? How neat! And I totally agree; keep the patina as-is.